Cirencester, "The Capital of the Cotswolds"
Image of Cirencester © Commatic Ltd.
Cirencester is an historic Gloucestershire wool town that had great importance in Roman times. It's impressive church dominates the Market Place and can be viewed for miles around. Cirencester has great road links to the surrounding area which makes it the ideal base for touring the Cotswolds. In the town you will find the famous Corinium Museum which had a major refurbishment and improvement programme a few years ago. Cirencester's Roman links are evident from the Roman amphitheatre which is open all year round. The Cirencester outdoor swimming pool is one of the oldest open air swimming pools in Britain. Cirencester news can be found by visiting the Cirencester news page of the Cirencester website or the Cirencester News website. The Old Brewhouse in Cirencester is a delightful 17th Century town house bed and breakfast full of charm and character, sympathetically restored and refurbished offering high quality accommodation. All rooms are well provided for and include TV and DVD or video player. (Small selection of DVDs and videos available for guests' use). The Old Brewhouse has a lovely garden to sit, weather permitting and ample parking to rear of the property. We are conveniently situated. Cirencester town centre is only a 3 minute walk away. The Ivy House is an imposing Victorian residence built in 1870, occupying a prominent position within a three-minute walk from Cirencester town centre (where you will find The Corinium Museum), a ten-minute walk from Cirencester Park and only a five-minute drive from the Royal Agricultural College. For a varied and rewarding shopping experience you are urged to give Cirencester a try. While there are the usual and recognised High Street names such as WH Smith, Waterstones, Boots, Clarks and The Body Shop, you will also find a number of smaller retailers and specialist shops dotted around this picturesque Cotswold town. The Cirencester Shopping website has loads of information on shopping in Cirencester, along with special offers, promotions and news from the shops. And when you are ready to give your feet (and credit card) a rest, there are plenty of places to stop off for a coffee or something to eat. Visitors to Cirencester may find this map of car parks in Cirencester useful. When the Romans built a fort where the Fosse Way crossed the Churn, to hold two quingenary alae tasked with helping to defend the provincial frontier c. AD 49, native Dobunni were drawn from Bagendon, a settlement of the Dobunni situated 3 miles (5 km) to the north, to create a civil settlement near the fort. When the frontier moved to the north following the conquest of Wales, this fort was closed and its fortifications levelled c. 70, but the town persisted and flourished under the name Corinium Dobunnorum. Even in Roman times, there was a thriving wool trade and industry, which contributed to the growth of Corinium. A large forum and basilica was built over the site of the fort, and archeological evidence shows signs of further civic growth. When a wall was erected around the Roman city in the late second century, it enclosed 240 acres (1 km²), making Corinium, in area, the second-largest city in Britain. It was made the seat of the province Britannia Prima in the fourth century, and some historians would date the pillar the governor L. Septimus erected to the god Jovian to this period, providing evidence of a sign of pagan reaction under the Roman Emperor Julian. The amphitheatre still exists to the SW of Cirencester, but has not been fully excavated. Investigations in the town show that it was fortified in the fifth or sixth centuries. Possibly this was the palace of one of the British kings defeated by Ceawlin in 577. It was later the scene of a battle again, this time between the Mercian king Penda and the West Saxon kings Cynegils and Cwichelm in 628. There are many Roman remains in the surrounding area, including several Roman villas near the villages of Chedworth and Withington, the most well know being Chedworth Roman Villa. The loss of canal and the direct rail link encouraged dependency on road transport. An inner ring road system was completed in 1975 in an attempt to reduce congestion in the town centre, which has since been augmented by an outer bypass with the expansion of the A417. Coaches depart from London Road for Victoria in central London and Heathrow Airport, taking advantage of the M4 Motorway. Kemble Station to the west of the town, distinguished by a sheltered garden, is served by fast trains from Paddington via Swindon. In 1894 the passing of the Local Government Act brought at last into existence Cirencester's first independent elected body, the Urban District Council. 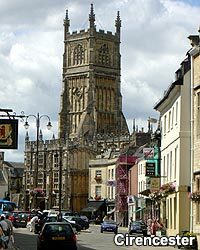 The reorganization of the local governments in 1974 replaced the Urban District Council with the present two-tier system of Cotswold District Council and Cirencester Town Council. A concerted effort to reduce overhead wiring and roadside clutter has given the town some picturesque streetscenes. Many shops cater to tourists and many house family businesses. The parish church of St John the Baptist, often referred to as the Cathedral of the Cotswolds, has a nave built in 1515–1530, and also features a high embattled tower and a remarkable south porch with parvise. A fine example of the wool church, among its numerous chapels, that of St Catherine has a beautiful roof of fan-tracery of stone that dates to 1508. Other wool churches can be seen in neighbouring Northleach and Chipping Campden. To the west of the town is Cirencester House, the seat of Earl Bathurst. The first Earl Bathurst (1684–1775) devoted himself to beautifying the fine demesne of Oakley Park, which he planted and adorned with remarkable artificial ruins. This nobleman, who became a baron in 1711 and an earl in 1772, was a patron of art and literature no less than a statesman, and Alexander Pope, a frequent visitor, was allowed to design the building known as Pope's Seat in the park, which commands a splendid view of woods and avenues. Jonathan Swift was another appreciative visitor. The house contains portraits by Lawrence, Gainsborough, Romney, Lely, Reynolds, Hoppner, Kneller and many others. Although Cirencester does not have its own train station, Kemble Railway Station is located just a few miles away and has a direct service to and from London. So if you are interested in getting to Cirencester by train then arrive at Kemble train station from where you will then be able to get a taxi to Cirencester. 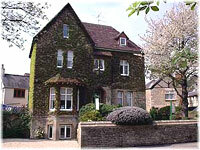 Cirencester is within easy reach of both the M4 and M5 motorways.